This morning I decided we needed a special (read: pink) Valentine's Day breakfast. You know what's delicious and pink? Strawberries. 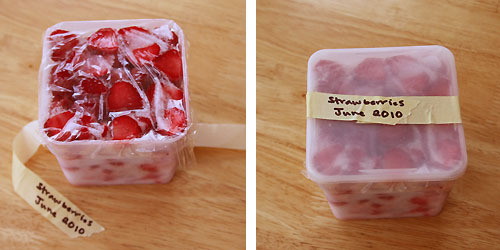 Remember way back in June, I froze some strawberries from the farmer's market? We've been eating them on pancakes all winter. I've still got a couple pints left, so I altered a recipe for blueberry muffins and came up with these sweet treats. 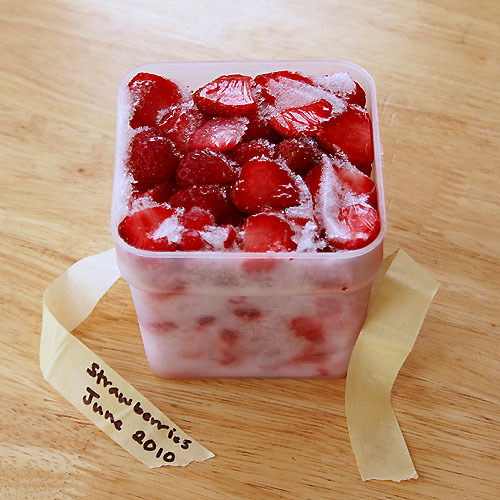 If you're thinking it might be a good idea to freeze your own strawberries this summer check out how easy it is: How to Preserve June Strawberries. 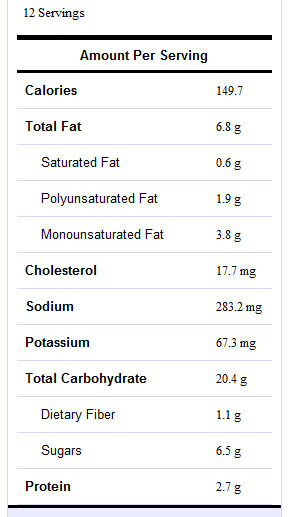 You could use store bought frozen strawberries, just be careful to get ones that don't have sugar added or if there is sugar added reduce the sugar in the recipe. 1. Grease 12 muffin cups and preheat the oven to 400 degrees. 2. Mix the wet ingredients (except the fruit) together in a medium bowl. Mix the dry ingredients together in a large bowl and then form a well in the middle. 3. Pour the wet ingredients all at once into the dry ingredients. Using a fork or a whisk stir together just until all the ingredients are wet. Stir in the strawberries. This will be a pretty thick batter. 4. Spoon the batter into the greased muffin tins. Top with the pecans and bake for 20 minutes or until the tops start turning golden brown. Yummy! That sounds awesome and it looks fantastic! 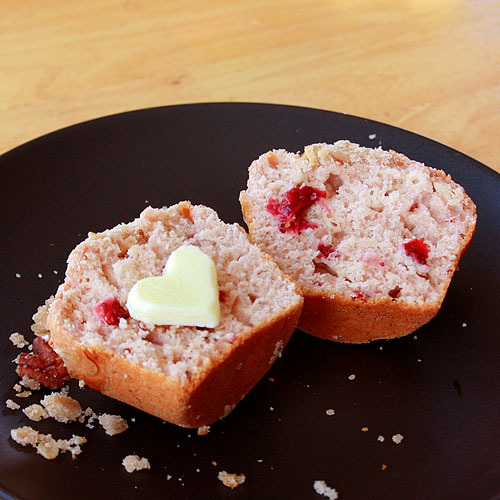 I've always wanted to bake strawberry muffins/bread. Love yours...and the butter heart is perfect!!! These look so cute and delicious! Love the heart-shaped butter too! I love anything with strawberries in it-these look delicious. I love the little heart shaped butter. what a cute touch. And strawberry muffins, my gosh, I love anything strawberry. 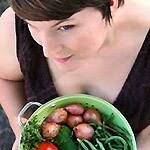 I am heading over to check out your post on preserving strawberries. Luckily we were able to get fresh strawberries this week that are grown locally. The climate is really mild year round here, it's fantastic. So, I'm going to try out this recipe. It looks great, thanks so much for sharing. Just a quick question, if I were to omit the dry powder milk and use milk instead, would the recipe work? How much milk would I need? cheers. These look SO tasty and perfect for the upcoming holiday. The heart shape pat of butter is a nice touch. @Veggiestestkitchen - The original recipe calls for 3/4 cup milk and no strawberry juice. To make room for the strawberry juice I switched to powdered milk. If you don't have the strawberry juice I would use a tablespoon lemon juice and the rest of the 3/4 cups liquid as milk. You don't want to lose the acidity of the strawberry juice completely. So adorable! Mmmm... Strawberry and muffins together, sounds and looks delicious! Wow, those look so tasty and I just love the heart shaped butter. How fantastic! Every summer I tell myself that I will freeze some of the gorgeous in-season fruit, and every summer I eat it all. Oops. I really must hoard summer berries and stone fruit this coming summer so that I can enjoy delicious baked goods - like these muffins - in the dead of winter! Ohhhh, that's so cute...I love how you shaped the butter into a heart! These look so pretty! I'm jealous of your store of summer strawberries! I'll have to bookmark this recipe until I can get some fresh ones! I am completely impressed by your love and respect for the food you make. Love your blog! Thanks for this great recipe! Very pretty and love the heart of butter. Talk about making your heart melt! Thanks for this great recipe! Going to try it. Congrats on your top 9! Wish I'd seen this yesterday morning. I made some very BAD strawberry muffins for Valentine's day. Oh well. There's always next year...or tomorrow. ;) Thanks for a yummy looking recipe. Yum! I have to make these. BTW, how do you get the nutrition info? Congrats on the Top 9. These look wonderful. I see you made something strawberry, sweet, and beautiful, too! The photos on your blog are wonderful. Thank you for befriending on Foodbuzz. I am really like this recipe. thank you sharing. I did something similar using not only strawberry but blueberry together. Nice heart butter slice- an interesting touch!! I may want to try your version. These look great - my sister loves using strawberries in her muffins/scones, but i always forget and use blueberries instead. great picture!